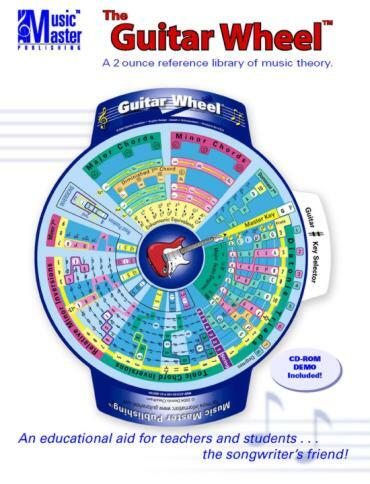 Following the 2005 release of the Guitar Wheel, the portable two ounce reference library for music theory, Music Master Publishing announced the release of the Guitar Wheel music theory method book at Namm summer session 2006 to be out in the fall of 2006. The book is aiming at the beginner as well as the intermediate player. The Guitar Wheel is a collection of music theory concepts for both piano and guitar organized in a way that will allow a musician of any level access to everything from basic musical concepts to advanced ideas. One side is designed to visually represent a guitar fret board; the other is more general music theory and uses piano as its main reference. It comes with instructions and a DVD introduction. The Guitar Wheel and method book will be available separately and packaged together. © 1997 © 2006Pro-Music-News. All rights reserved. Thank you for visiting Pro-Music-News.